When you have three kids under the age of 5, it seems like someone is always sick. And in my wacky house, we are sicker in the summer than in the winter. In fact, my little Marky has been to the doctor three times this summer for sick visits. That makes four sick visits total in his 2 1/2 year life. I'm a little less than impressed. Yesterday Mark started wheezing and you could see his chest going up and down from across the room when he was breathing. We were at the doctor's yesterday afternoon and Mark was diagnosed with a lung infection. I had a parenting first when I left the pediatrician’s office with a prescription for antibiotics. It's a little sick to say this, but I was glad that I didn't pay $25 for nothing since that's our usual MO. But I had a great run while it lasted since it took us 4 years and 5 months of parenting before we had to give a kid antibiotics. So meet my blogging sidekick today. He cannot breathe if he's lying down so that makes a nap impossible. Yesterday he slept on my shoulder during naptime, but today he's not interested in napping. Today he is interested in whining and sitting next to me all day and driving me nuts. Although it is an improvement since yesterday he was in my arms all.day.long! While running a fever. Making me feel like a horrible mother for wanting nothing more than to put him down. He will be better soon and one day he'll be so grown up that hanging out with mommy is just too uncool for words. So we are working on the computer together and he even sat still long enough for me to take a webcam picture of him. 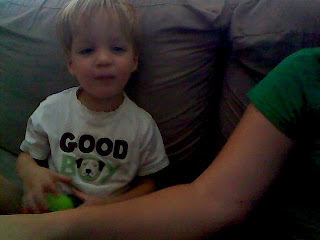 And as he's sitting here next to me bouncing off the walls and wanting to play instead of rest, I really want to know. Why do sick kids still have more energy than a healthy adult? AWWW poor guy and poor Mommy, too! Hope he gets to feeling better soon. Also, hope you are able to get a break.